If you share your blog posts to your social profiles on a regular basis then Syndication might be your favorite feature. It saves you time and automates some of the repetitive tasks in your day. Set it up once, and then it automatically shares every new blog post you write to your social profiles on an ongoing basis. Symphony offers the fastest syndication in the industry: once a new blog post appears on your blog, Symphony detects it and publishes it to the social profiles that you’ve selected within seconds for most modern blogging platforms, and in less than 5 minutes for older blogging platforms. 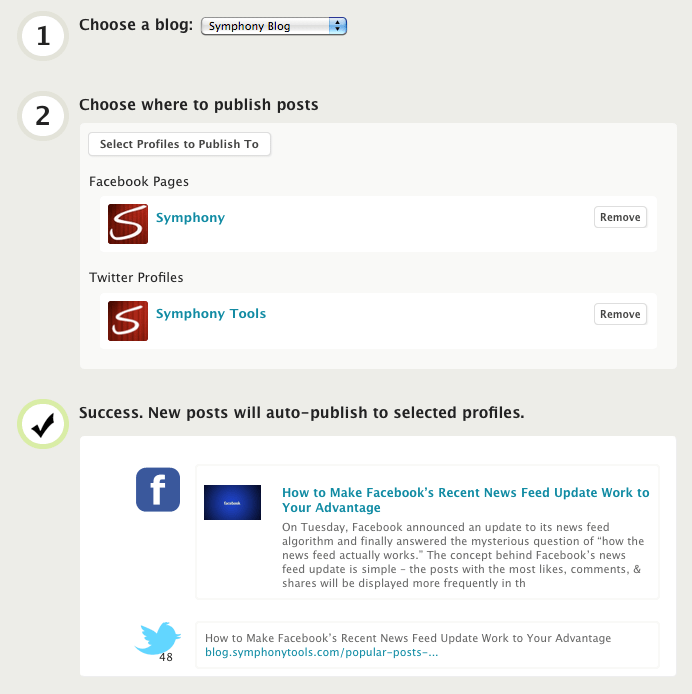 As with any other feature, the first step is to connect your blogs and social profiles to Symphony. In this case, connect the blog that you want to syndicate, and also connect the social profiles that you want to publish to, such as your Facebook pages, Twitter accounts, and LinkedIn Profiles. You do this by clicking on the “Add Profiles & Blogs” button. If you’re having difficulty with this step, see more details here. On the Symphony home page you’ll see the Syndication box at the top of the page. Click on “Setup Syndication”. The preview at the bottom of the page shows you how your most recent post will look like on each of the social networks you selected. You’re all set. Going forward, any new blog post you write on your blog will be automatically shared to the social profiles you selected. Q: Can I syndicate more than one blog? Yes. You can repeat the same steps to add another blog. And you can set different syndication targets for each blog. Q: Does syndication publish old posts? No. Syndication works going forward. It auto-publishes new blog posts that you write after syndication was activated. If you want to share existing posts, use the Crosspost tool. Q: My posts are being shared without images, or with the wrong images. Why? Use full feeds, not partial. In WordPress, go to your dashboard then select Settings -> Reading -> Set the option For each article in a feed, show to Full Text. If you’re on Blogger then it’s Settings -> Other -> and then set Allow Blog Feed to Full. If you’re on WordPress and you use Featured Images (i.e. images that are not embedded in the content of your post) then those images are not included in your RSS feed. You’ll need to install the Featured Image in RSS plugin to include your featured images in your feed. After you’ve made the changes above, refresh your feed (see next question) and verify that your images are being read correctly. If not, reach out to us on the chat box in Symphony and we’ll look into it further. Q: How do I test my RSS feed and make sure it’s working? Symphony has a built-in feed tester. From the home page, find the box of your blog and click the “Refresh” link. That will show a green message detailed the status of your feed and the latest article. It will also include a link to the Feed Tester tool.